I am sure we have all experienced this before - there's a dinner party happening in a few hours time, and you need to "bring something". You decide to go for a bottle of wine at a nearby supermarket, because everyone can enjoy it. Problem is, you don't know which wine to buy at Fairprice, or Cold Storage, or even Sheng Shiong, because there's so many of them. Secondly, you have a budget to stick to and unless you're going to a wine tasting session, as long as it gets people happy and doesn't taste like vinegar it is fine. Well, at least that's what I face. Fortunately for me, I have a huge wine and coffee geek brother and today at NTUC Fairprice he decided to introduce a few "safe" wines that I can buy. Please, don't ever get Jacob's Creek or Kangaroo Ridge because you might be better off just juicing up that cash. 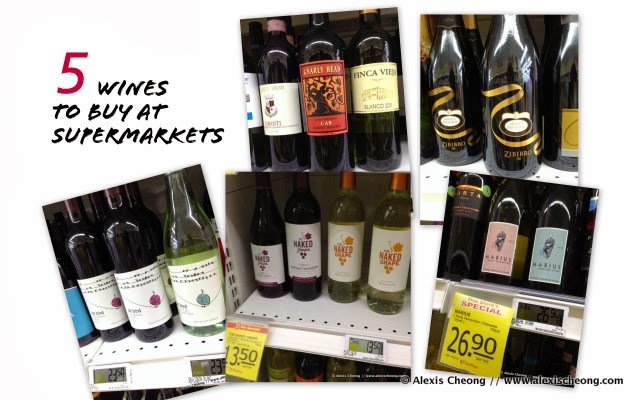 So here I will introduce you to 5 wines to buy at Fairprice. 1. First, the Gnarly Head Cabernet Sauvignon. When he saw it he immediately exclaimed. For S$29 it is slightly pricey because they will have promotions for it other times, but still a solid one. Almost bought it. 2. Of course, he knows I love sweet wines and thus moscatos are usually very drinkable. The Zibibbo moscato is selling for for S$20.95 from the normal $24.55 and highly recommended. I grabbed it. 3. But then, we saw The Naked Grape going on a huge promotion. It's almost 50% off with the usual $26 wines all selling for $13.50. Yes you heard right. $13.50! The cab sav he said wasn't that great, so I grabbed the two bottles of moscato and the pinot noir (great one). So in the future, if there's a promo for the Naked Grape, GRAB THEM. 4. Then we saw Fat Bird, which he said are generally good wines to get by default. Also I love their label! It's so cute! $23.50 is really reasonable. (2019 update: I can't seem to find anymore Fat Birds, but there's Quirky Bird from Western Cape, South Africa which seemed nice - they are different, though). 5. Lastly, something produced by the French - Marius - which had really cool hipster labels and comes from a good vineyard company. He hasn't tried these, but said it should be trustworthy enough. And at a special promotion of $26.90 (no original price listed though) it should be a good experiment for everyone to taste and judge. And there you have it! 5 wine labels to grab from the supermarket if you see them. Hope this helps. Bookmark and share this with your friends and everyone will be the better for it! Kangaroo Ridge is a reasonably good wine for below $15 (offer). It is often my first choice. Kangaroo Ridge is a very drinkable wine. It is very good value when offered below $15 and is usually my first choice, I particularly like the Shiraz.